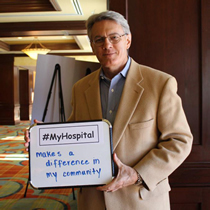 #MyHospital - What does your hospital give to your community? Join the AHA’s #MyHospital digital campaign by sharing photos or videos with the AHA highlighting the important role hospitals play in their community using the tag #MyHospital. The AHA will promote the photos and videos during National Hospital Week, May 6-12. Stand with hospitals and patients across the country and tell lawmakers why we must protect hospital care from further cuts. Simply use your smartphone to take a picture or create a short video of your employees and hospital leaders, sharing what your hospital means to your community. 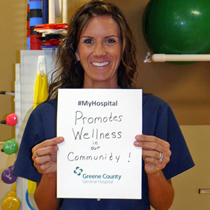 Focus on answering the question: "What does my hospital bring to my community?" Does it strengthen your community through working directly with families in need? Does it treat your community’s most vulnerable by working with the uninsured? Does it inspire you to do good beyond the walls of your hospital? Does it put a smile on your face when you connect with patients? Do you feel a sense of LOYALTY, PRIDE, EMPATHY because of the great things your hospital does for your friends, family and community? You can find a digital toolkit, #MyHospital sample template, and more here. As soon as you record your photo or video, simply share it with AHA by using #MyHospital on Twitter, Facebook, or Instagram.